So you’re building a Windows 8 application and you want to authenticate against an external service. For this it’s likely that you’re going to want to store a username and password for the user so that you can query off to the external service without bugging them constantly. This was something that I had to do for my Pinboard for Windows 8 application so I wanted to make sure that I was doing it above board and no one would think I’ve been sneaky and abused their privacy. First off you need to create a resource key for your application; this is an identifier for your application’s credentials. The FindAllByResource method will provide you with all the credentials you’ve stored, you can then filter this down as required to find the particular user you’re after. This user object will have a password property that you can do what ever you need to do. Le sigh… I haven’t found any better way to do this other than trying to get all credentials using the retrieveAll method but that implies that it gets back all credentials regardless of the resource key, which is what we really want to identify our application. And there we go, all stored securely inside the Windows security store. The other cool thing about this is that it allows credentials to roam between devices, I haven’t been able to put this to the test yet though as I only have one machine with Windows 8 on it so roaming isn’t all that viable! 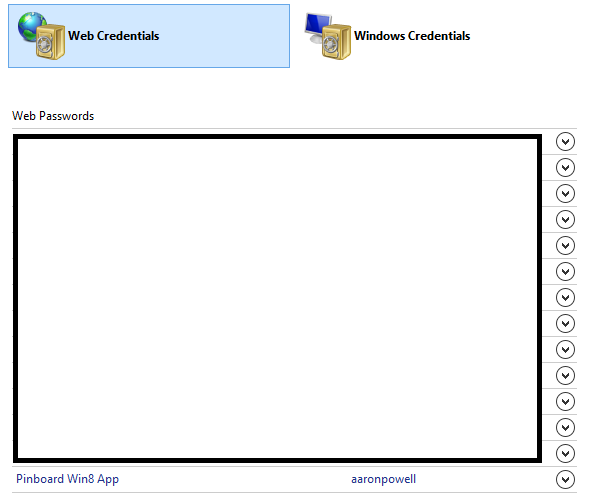 Storing credentials in Windows 8 is so simple but it has some strangeness about it. Your main point of call is the PasswordVault class, part of the Windows 8 runtime, which gives you a simple programming interface into the Windows security store.